Yes on the R/T wheels and spacers. It sure looks killer........Where'd you get the Cobra chin spoiler from? I definitely want to add one to mine. 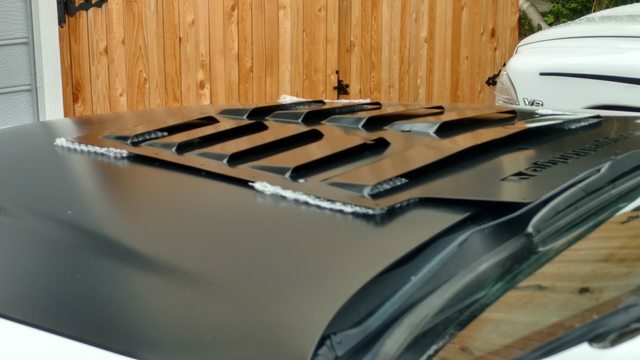 So the "cobra chin spoiler" what is this off of? A mustang I assume? what year? You can buy them brand new on ebay shipped for about $60-$75. 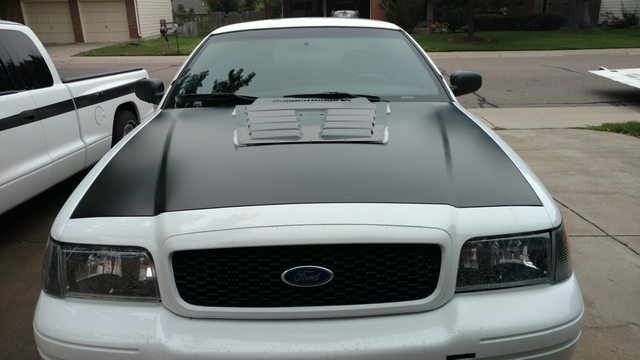 For '03-'04 Mach I Mustang. Well now I did it, got an 04 Mercury Marquis unlimited edition at auction for cheap. It was a donation vehicle, no damage, no rust, nice inside too. Didn't really know what I bought until I got it home and started checking it out. It sure is loaded up with options. Heated leather, radio etc. controls on steering wheel, factory CD changer in the truck, and rear air bag suspension. 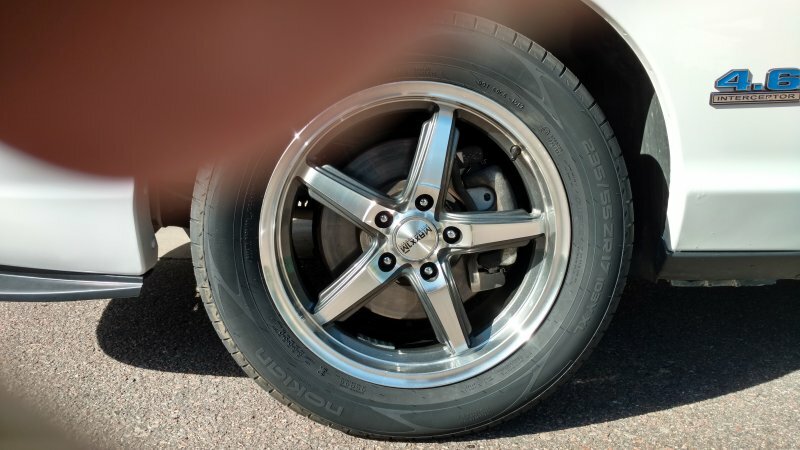 The Challenger wheels photo'd will be a direct fit for '03 and newer. My '02 and earlier require a 1.25" - 1.5" spacer. Just tried the Challenger wheels on the 04 Merc. They hit the front calipers to the point you can't seat the rim on the rotor. What is the width and offset of said wheels? Also, keep in mind that even if those specs are accurate, the wheel face itself was not designed for the brakes the vic has, but instead the brakes that the Challenger uses. They may not clear without a spacer. 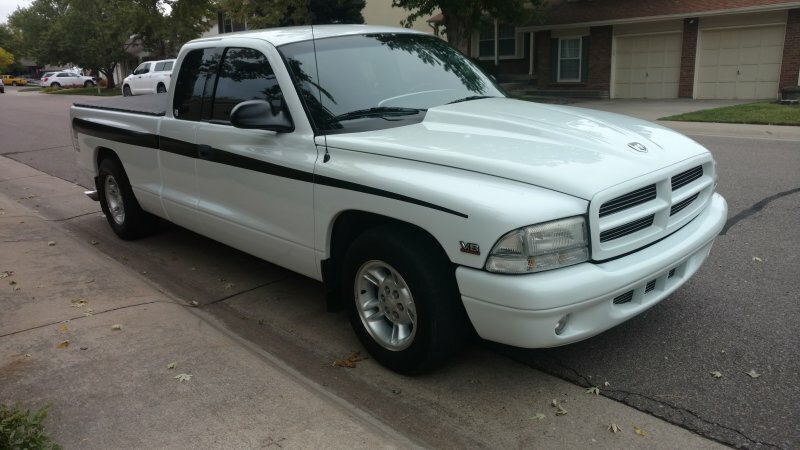 Well, time to resurrect yet another of my old threads....... this post has kind of a deja-vu kind of theme.... December '15 I'd sold the 'Vic and picked up a 5.9 R/T Dakota. Dakota got sold in '16. Here I am now in August '18...... and have both a Dakota and a 'Vic again...... lol! 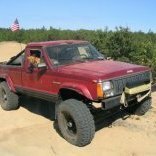 I've posted the Dakota before but for this thread I'll just re-iterate - Kenne Bell supercharged 5.2 and Hurst 5 speed, lowered suspension. 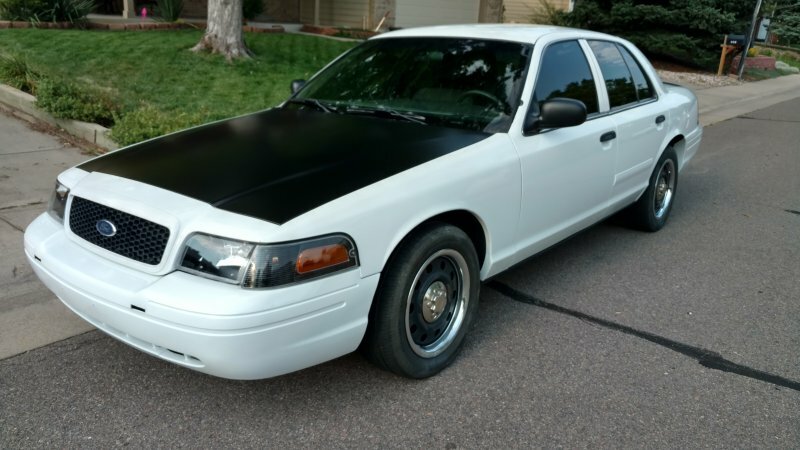 And a couple weeks ago, I brought home an '08 P71 'Vic with 84K miles (and only 1172 running hours.....) and the rediculous water based paint peel issue. Super clean inside as it was a supervisor car, so never had a cage in it and the agency that had it, used a unitized center console for computer and radio so no holes in the dash. They put a brand new windshield in, tinted the windows and cleared out the massive police wiring harness too. '06-'11 'Vics have the big brakes, big sway bars, heavy duty springs/suspension.... in short..... amazing track cars. Which is what this one will be for me. Road Course and Auto Cross time! I actually have a build fund for this car, so this is happening. Already grabbed up a set of 6 track tires (235/55/17 Nokian Z Line summer performance) for a whopping $580. Will be placing a Jegs order for an Accel coil pack set and NGK plugs, PowerStop Z26 front and rear drilled/slotted rotor and pad kit, and possibly an OBD2 digital gauge interface so I can keep an eye on the temps, pressures, conditions. I intend to hit the junk yards to find the push bar bracket that sticks out of the front bumper so I can fab up a D-ring mount/track tow point (worn out taxi P71's are getting dumped by the hundreds into the yards around here). 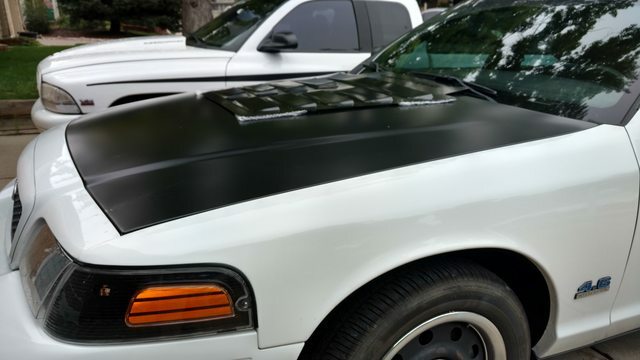 Gonna get it re-painted white, will flat black the hood, add a Mach 1 chin spoiler and picked up a custom trunk spoiler that will be flat black, and thinking of putting a Boss 302 style hockey stick or "C" side stripe kinda thing just to break up all that white..... and kinda fit the theme I seem to have going with the Hellcat and Dakota. 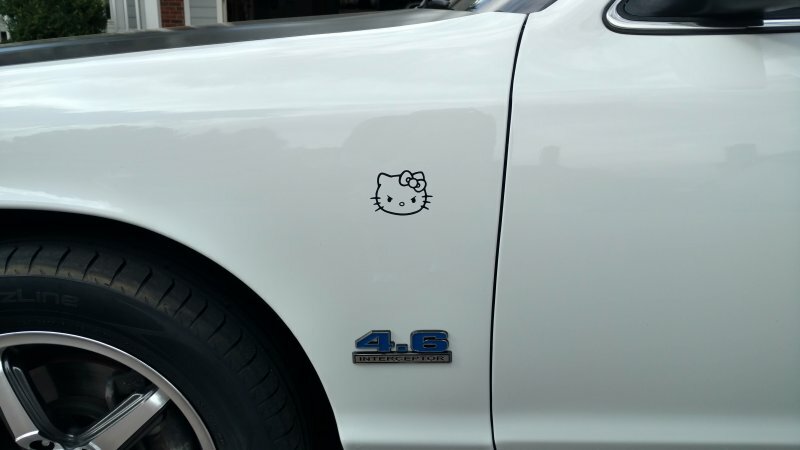 Or maybe get silly and paint the wheels Brass Monkey (like the Hellcat) and put a black vinyl Hello Kitty graphic where the Hellcat head would be on the fender.....lol. I've thrown these cars around our training track back when we used to do pursuit driving training (a BMW club owned road course track) for years and they're a hoot! So, since my insurance (and my wife) won't let me run the Hellcat on the track, this will have to do. All said and done, I'll have maybe $4500/$5000 into it. So, yeah..... I'm no longer a Comanche owner. I've developed other interests and am pursuing them.... but Comanche's will always occupy a huge part of my soul - automotively speaking anyway. So, if y'all don't mind - I'll hang around, watch you guys play with your MJ's. I didn't realize they upgraded the brakes again. once upon a time we had a late 90s Grans Marquis that I eventually swapped out all the brakes (and other stuff) from an '02 in order to get the "big brakes" and eliminate the grandma-mobile ride. I may need to stop by and take yours for a test drive some day. 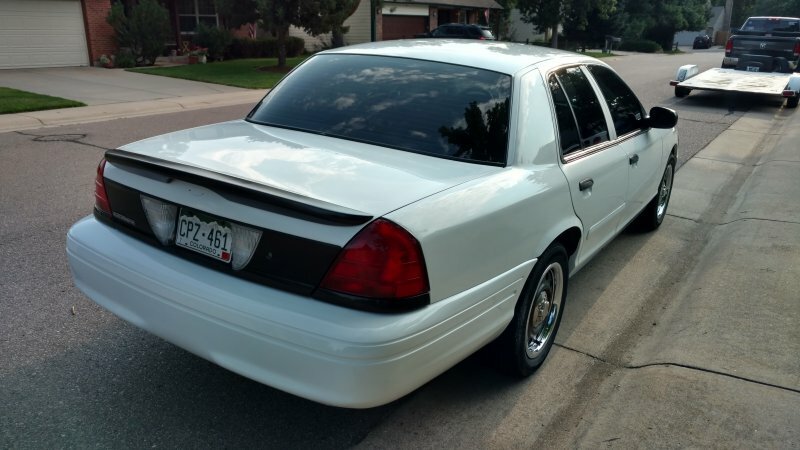 I spent the past 18yrs of my career with the P71 Interceptor. They do have some quirks, but very solid vehicles. I have a co-worker with a 98 P71 that has 345k on it. He drives 80mi round trip to work\home every day in it. 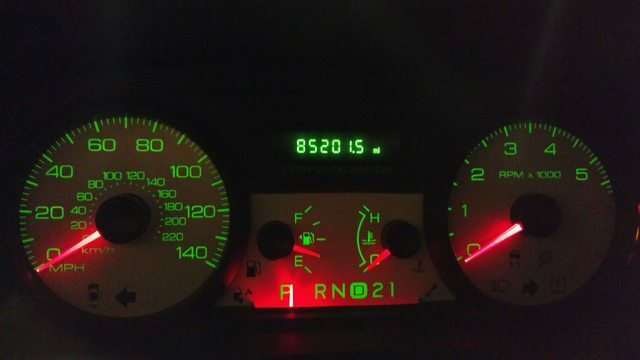 It's been tweaked to the point he's getting 21mi per gallon. 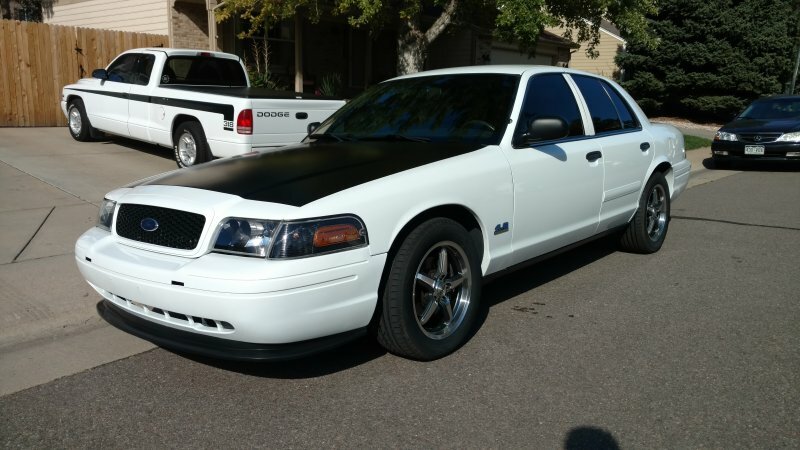 He also has an 04 P71 drag car. Twin turbo 5.4 under the hood. It's a freaking beast. ... and put a black vinyl Hello Kitty graphic where the Hellcat head would be on the fender.....lol. Glass packs and 2.5" black tips installed today. Definitely NOT a cop car anymore, no sneaking up on anyone....lol. 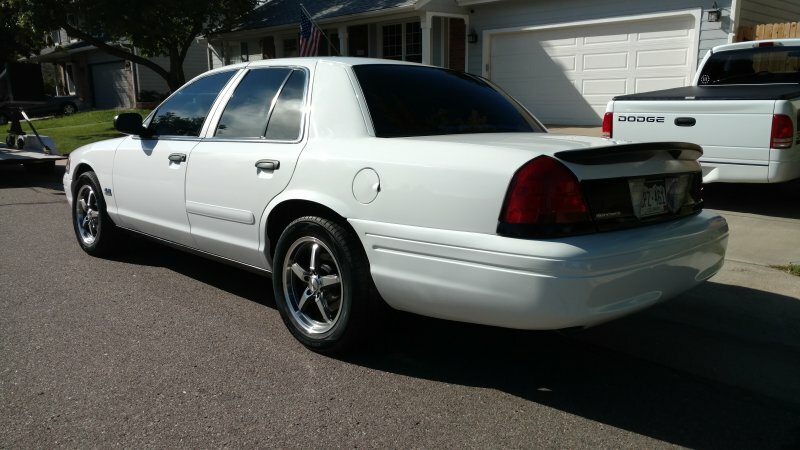 PeteM: Yeah the P71 wheels are the tattletales of the brakes the car has. '06-'11 wheels have a serious off set and negative dish to them to accommodate the quite large calipers. The PowerStop Z26 brakes were ordered last night so I'm looking forward to seeing the difference as the OEM brakes are pretty damn good - this coming from a guy that is used to the amazing brakes on the Hellcat. I'm about $4400 into this car now and not much else on the list to buy for it other than a cheapie paint job so I'll "done" with the build at just under $6K I'm projecting. 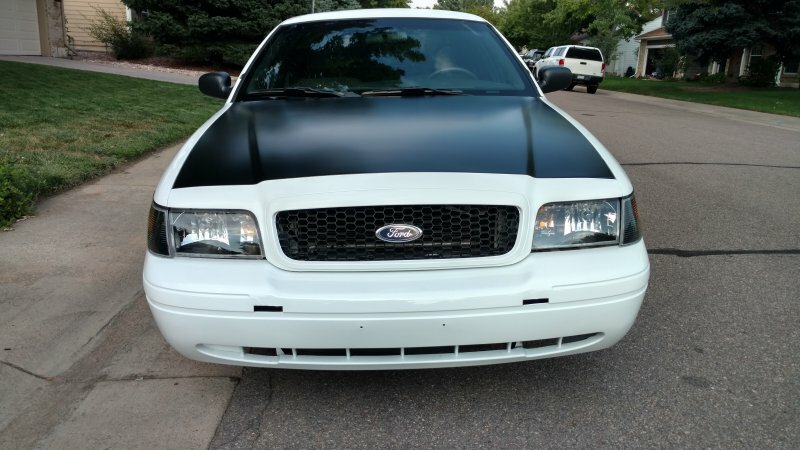 $1600 in paintwork - done. It's a 20-footer. Jegs packages arrived with the brakes and ignition stuff - Wife goes on a business trip soon..... I think I can squeeze those in between honey-do's...... lol. I just helped with a blend for motor on an 04 last week. I can still do one in under 2hr! 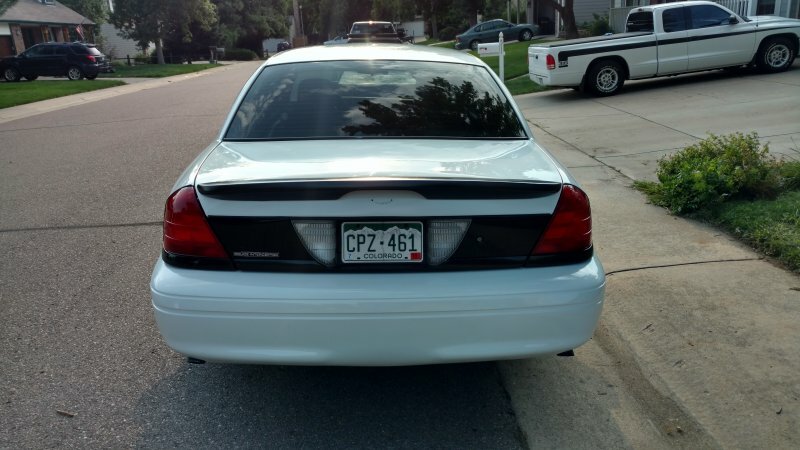 Trying to figure out how I do a blend door motor on a P71 Crown Victoria in under 2hr? Well it's more of a shortcut to get it done in under 2hr. Remove dash trim, cluster, radio, upper trim, glove box, passenger air bag, kick panel on both sides, lower dash bolts on center hump, and HVAC duct behind passenger air bag. Loosen driver's side dash mounting bolt, remove passenger side bolt. Remove the 3 upper screws by the windshield defrost. Use piece of 2x4 between A-pillar & passenger dash mount.Unplug blend door motor, remove screw closest to you. ***Here's the first part of to the trick!!!! If you use a set of dykes you can snip out a 2in wide section of the upper dash directly above the screw closest to the driver. Use a long 1\4" extension with a short swivel 7mm socket, and remove the screw closest to the driver. I use a 9" long set of side cutters to snip off the plastic stud where the 3rd screw goes. Then you can remove the actuator. I removed the 3rd screw from its mount, and reattach the mount with epoxy, and reinstall the screw with just enough clearance for the new one. I use a box cutter to cut the rear mounting hole on the new actuator motor. This leaves it open like a horse shoe. Reinstall actuator motor, and reassemble the dash in reverse order. "I just helped with a blend for motor on an 04 last week. I can still do one in under 2hr!" 2. The "I can still do one in under 2hr" part. You said you helped..... so you and the person you helped got it done in under 2hr. 3. When were we talking about blend doors? Those were the basis of my confusion. 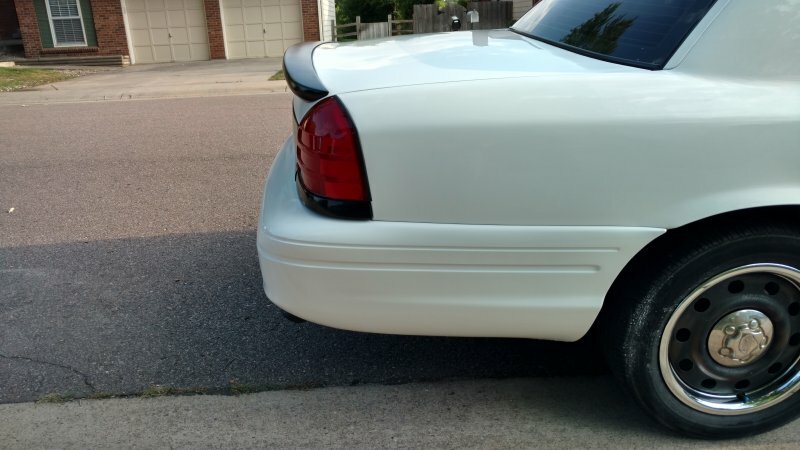 my grandparents had a big white boat (96 grand marquis) and all I can think of is its "handling" characteristics. I definitely want to take yours for a test drive some day. 1: Blend door actuator motor is an electrically controlled motor that moves the blend door in the HVAC system. That's the door that changes from heat to cool. They seem to always fail in the summer, and in the default heat position. 2: I did get his help with about 6 or so screws, bolts, nuts. I have a bad back, so getting in the floor board to remove & install trim & hardware is tough on me. He took care of that at my direction. So 1 person can do it in under 2hr if you follow my steps, and have some mechanical understanding. 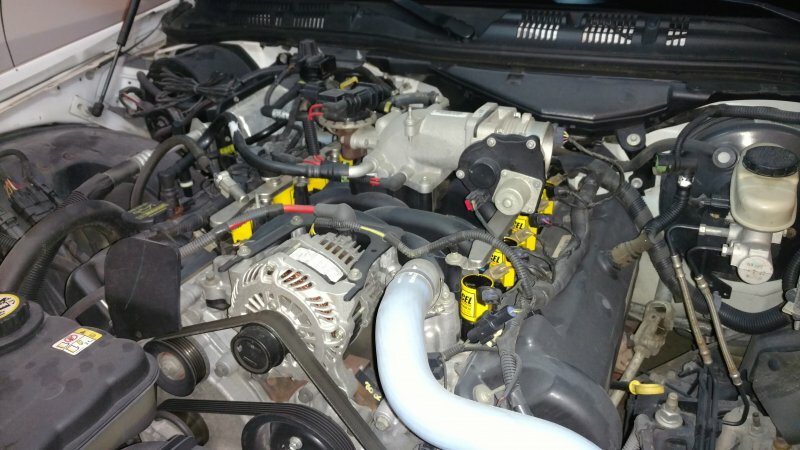 Doing that job in under 2hr is something I passed along to others, as the service manual called for removal of the dash, evacuation of the AC system, and partial removal of the HVAC air box behind the dash. If I remember correctly the flat rate box hours for that job are 7.5hr. I was thinking about the past 18yrs I worked on a Municipal police fleet, and 3 years previous at a Ford dealership. 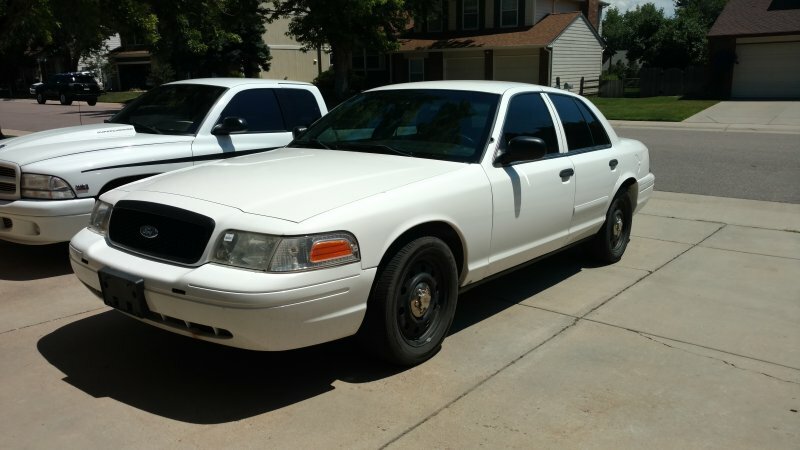 Several officers have purchased them from surplus, as they are still the vehicle of choice, and I worked on a good many of those in my off time. Lots of performance upgrades. That repair in particular is a very common repair. Those actuator motor fail regularly. I meant to expand on my statement by saying that it could save you allot of money, time, or both! That's a very costly repair with the average shop charging between $85-125hr. Shops charge flat rate book hours. So 7.5hr x $85 = $637.50 labor + parts. Auto techs get paid by flat rate, so $20hr x 7.5hr = $150 to the tech. If he takes 10hr, he still gets paid 7.5hr rate, and if he does the job in 2hr, he gets the 7.5hr rate. So he could make $150 in 2hr instead of 7.5hr. then on to his next repair. I was actually going to send you a PM with the little how to I posted, but couldn't find it. I had to retype it. Then you ended up asking before I could get free to send it, so I posted it. I didn't mean to interject, and derail your post. 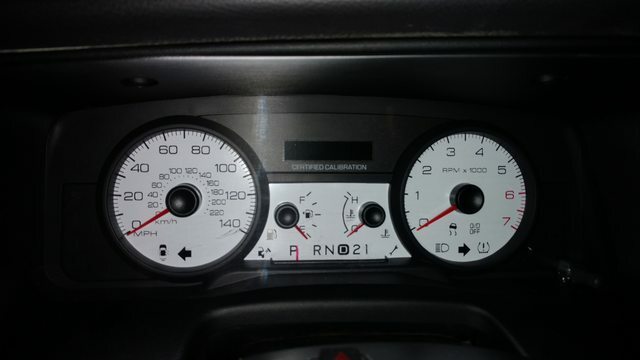 The instrument cluster is buried in a shadow box in the daylight, hard to see/read the instruments. So, white face kit. 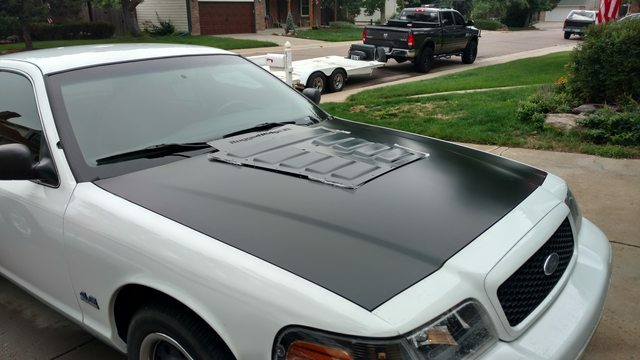 Teaser hood vent pics. 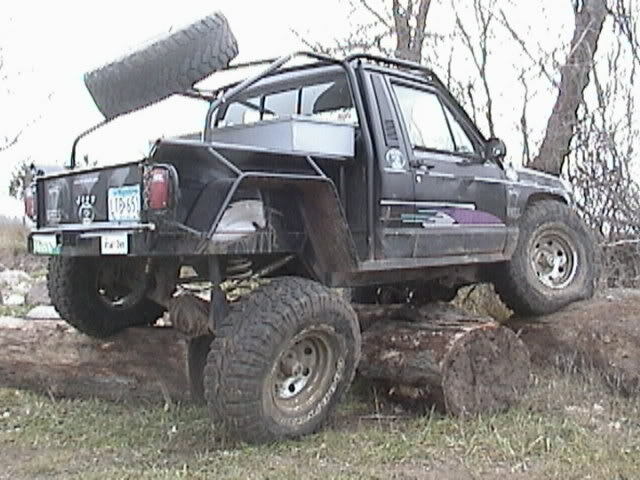 Rugged Ridge meant for a JK. Gonna find someone with a large sheet metal shear and cut the back part off. 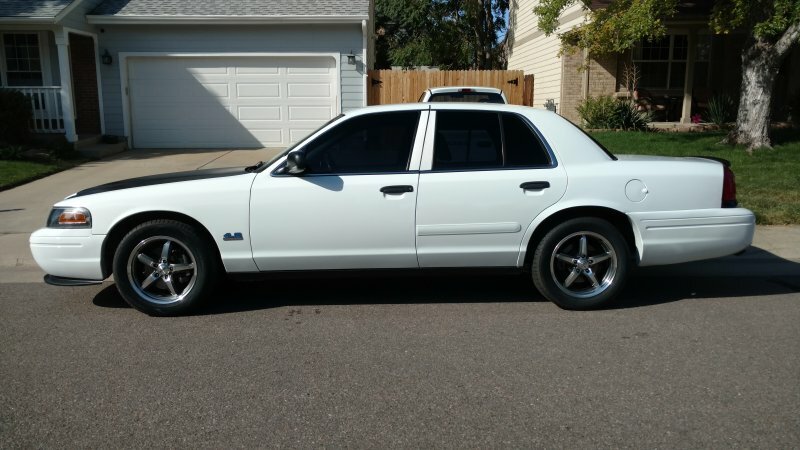 Wanting to keep the tires/wheels I have as rollers to put on for winter storage (the Nokian's will likely flat-spot since they're so soft) so I had a buddy who manages a police fleet garage hook me up with 6 OEM steel wheels to mount the track tires on. Unfortunately, 3 of the 6 are tweaked and not usable or won't balance in spec so I had to hit craigslist to look for some cheapie wheels - figured if I'm gonna throw money at the wheel issue, they should be lighter and allow good heat dissipation. Found these for $230. A little blingy but they'll do the trick. Hoping to find 2 more, but they're no longer being made by the Mfg. so fingers crossed for another cheap used set. 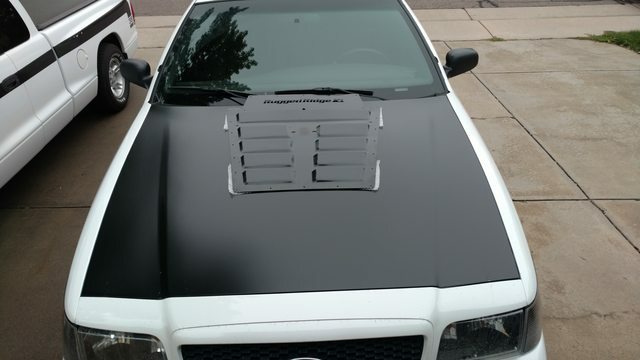 Got the hood vent cut down so I'll need to paint that up as well and then cut the hood. Debating on if the vent should be gloss, or flat. I like them. you can always hit them with paint if they are too shiny. you can always hit them with paint if they are too shiny. Don't do it - they look great. You need a bit of bling to break up the white / black scheme.